Gina Bloom, an English professor at the University of California, Davis, came to UCSB on Friday to present her ongoing efforts of bringing Shakespeare to the larger populace in the form of video game programs. In the talk that she gave, “An Apology for Declamatory Acting, Reclaiming a History of Amateur Performance through the Digital Shakespeare Game: Playing the Knave”, Bloom explained the visions and goals that she hopes to achieve through bringing Shakespeare into a more modern and accessible platform. “Playing the Knave” is a game program that Bloom and her colleagues had developed, using Kinect technology to detect human bodies, allowing anyone to participate in Shakespearean plays by acting in front of the detection range of Kinect. The game currently already offers many well-known scenes from plays such as Hamlet, Macbeth, and As You Like It. The system allows its players to pick scenes, types of stage to act on, and a 3D model avatar to mimic player movements. This can lead to many comical situations: as a robed, crowned, old Macbeth soliloquies, he is invaded by Macduff, portrayed as a blue-hued alien humanoid. Through countless public play sessions, Bloom found that Kinect’s inability to pick up minute details of human action has led its players into using “declamatory acting” while the players might not be even noticing it. Declamatory acting refers to acting with grandiose gestures, large physicality, and using specific poses to portray character emotion. According to Bloom, this type of acting is often seen as “an earlier, less professional theatre”. “Declamatory gestures can successfully deliver the meaning of a line even without plan and care and subtlety,” Bloom said, dissenting from that view. Nowadays people associate professional acting with a naturalist style of acting, hence the systematic rejection of the declamatory style. Bloom dislikes this rejection to the professional pursuit of acting. “Whenever a new acting school had presented itself, further legitimizing acting…it begins by dissing prior acting styles as not effective because it’s not natural enough,” said Bloom. Bloom worries about this trend in theater, as “unlike many of the performing arts: singing, dancing, even playing a musical instrument, acting is now generally seen as something that’s best and only left to the professionals.” The effect that this has can be troublesome. “The absence of theatre in the mass entertainment is a symptom of a peripheral status among the performing arts,” said Bloom. Playing the Knave, therefore, is Bloom’s response to this widespread symptom. 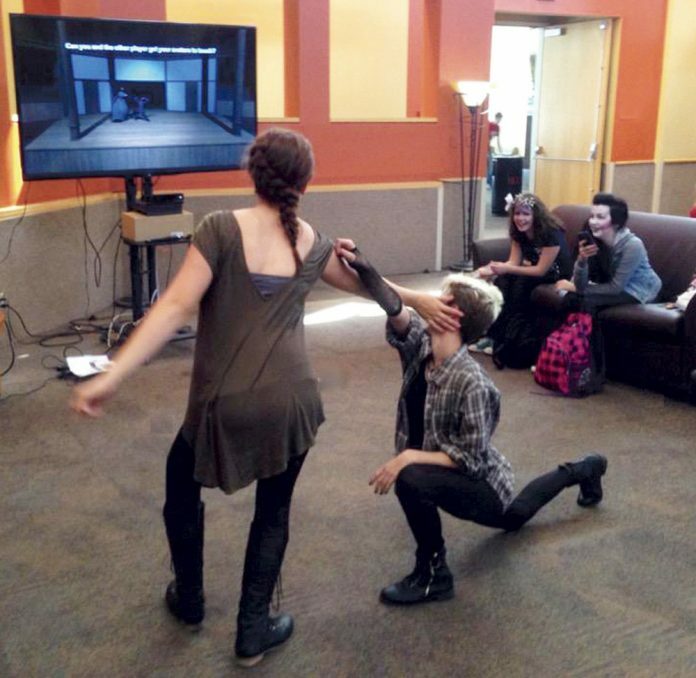 In a video game form, Bloom seeks to get people to abolish this professionalized stigma of theatre, and encourage more people to be “self-professed amateurs visibly demonstrating the work of trying to become a professional”. Her vision is that eventually “the public will be ready to take on Shakespearean acting as a form of informal, impromptu, personal entertainment…something they might casually do with friends, without any training”. In a Q&A session Bloom also pointed out how Playing the Knave differs from mainstream video games. Many popular video games aim to immerse their players into their fictional world, allowing their players to escape unimaginative and perhaps tedious reality. On the other hand, the focus of Playing the Knave, according to Bloom, is “about this space, it’s about the act of playing, acting…and not about what’s on the screen”. In the end, Bloom hopes to disallow the immersion people hope to receive from traditional video games, but rather “get the audience [players] to feel like they’re on a theatre stage, to actually experience the phenomenology of theatrical production”.